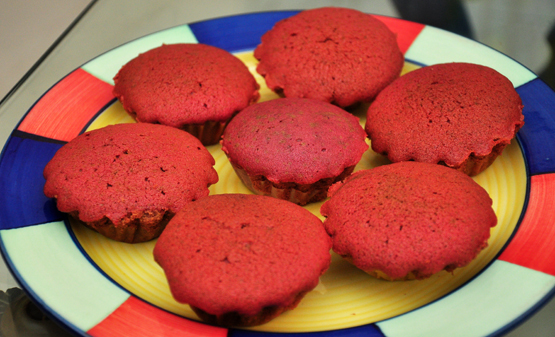 I wanted to try out red velvet cupcakes with beetroot juice since a very long time but even though we eat beetroots very often, I wonder why it took me so long to try it out! Anyways, I’m really glad I finally did. In most of my cooking & baking I try to use minimum food coloring. I know the red food coloring does justice to the red velvet cake/cupcakes but I was happy with the final outcome of the cupcakes. Besides, this time I used vanilla butter cream frosting instead of the cream cheese frosting because the cream cheese was not available in the speciality stores. The weather conditions in Pune did give me a hard time with butter cream frosting but I was happy with the final look even though I had to do several rounds to the fridge & back. Above all, my experimentation with the red velvet paid off… the cupcakes just disappeared & I realized that my efforts were worth it! 1 tbsp. regular or Dutch processed Cocoa pwd. Pre-heat oven to 175C & line 12 muffin tins with paper cupcake liners. In a large bowl, sift together the flour, cocoa pwd., salt & baking pwd. In a sufficiently large bowl, beat butter until soft with an electric hand mixer for about 12 mins. Add sugar & again beat until light & fluffy (about 3 mins.). Add in the egg & continue beating until well incorporated. Scrape down the sides of the bowl & then add vanilla extract/essence & beat until well combined. In a measuring cup whisk beetroot juice with buttermilk. With the mixer on low speed, alternately add the flour mixture & buttermilk to the butter mixture in three additions; beginning & ending with the flour. In a small bowl/cup, combine the vinegar & baking soda. Allow the mixture to fizz & then working quickly fold into the cake batter. Divide the cake batter evenly among the lined muffin cups & smoothe the tops with an offset spatula or the back of the spoon. Bake in a pre-heated oven for approx 18-20 mins or until a toothpick inserted in the centre comes out clean. Cool the cupcakes in their pans for about 10 mins. & then remove them from their pans. Spread the frosting on each cupcake with a knife or pipe out the frosting with any of your favorite decorating nozzle tip. In a sufficiently large bowl,cream the butter with an electric hand mixer until smooth & well blended. Add in the icing sugar, a little at a time with few tbsps. of milk. Add the vanilla essence & continue beating till the mixture turns light & fluffy. Add in more sugar & milk if needed. 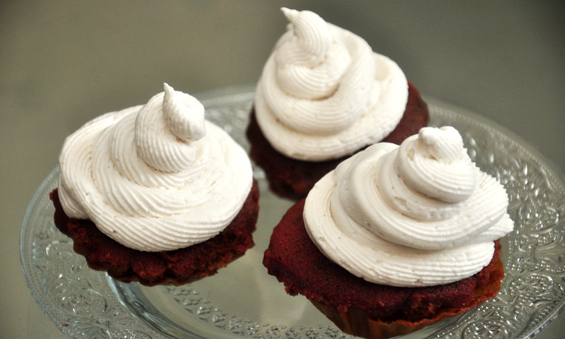 Fill in a piping bag fitted with a decorative nozzle & decorate the cup cakes or spread the frosting with a knife.